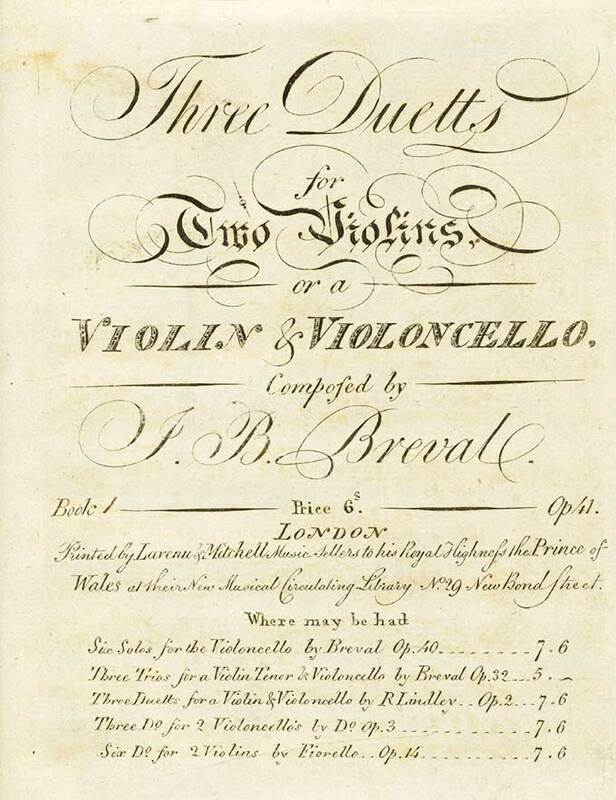 Bréval: Three Duetts for 2 Violins or Violin and Cello Op 41, No. 4 in D Major, No. 5 in E Minor and No. 6 in F Major. Set of three 1798 (parts only) and modern performing edition, score and parts, including cello parts. Jean-Baptiste Bréval (1753–1823) was a French composer and cellist. His Treatise on the Violoncello, Op. 42, was published in 1804. The Six Duetts, Op. 41, for 2 violins or violin and cello were written ca. 1798. Duett No. 4 in D Major has only two movements: a sonata form first movement and Aria con Variatione second movement.Duett No. 4 in D Major has only two movements: a sonata form first movement and Aria con Variatione second movement. Duett No. 5 in E Minor has only two movements: both are sonata forms. The first movement is marked Allegro and the second movement is marked Presto. Duett No. 6 in F Major has sonata form first and third movements, the first marked Allegro and the third Presto ma non troppo. The second movement, marked Adagio, is titled Cantabile.